Part of This Complete Dessert… I Mean, Breakfast. 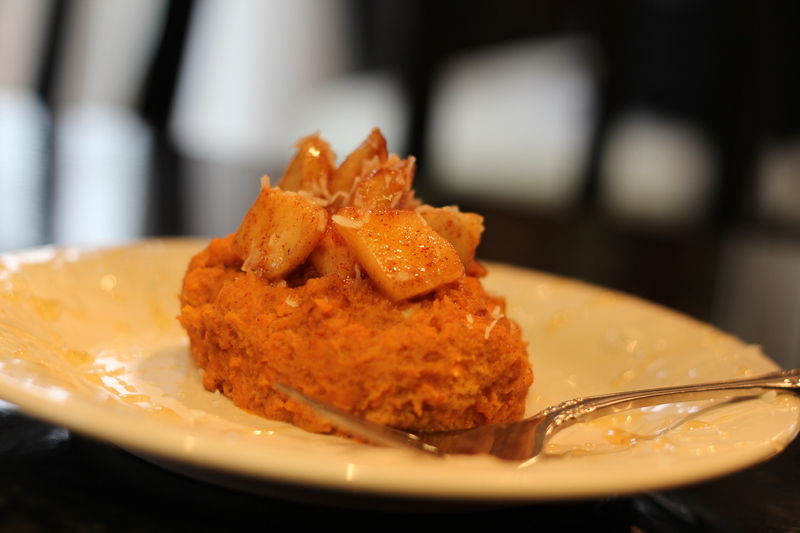 Sweet Potato “Scramble” with Cinnamon Apple Topping. The air today is crisp and clean with the breath of winter. This made it the perfect morning to warm up the kitchen and experiment with one of my favorite foods: the sweet potato. Not only are sweet potatoes delicious, but they are incredibly good for you! Filled with Vitamin A and C, beta carotene, fiber and antioxidants, sweet potatoes play an important role in preventing inflammation and keeping your body safe from free-radicals (which can cause cancer, among other health related issues). Now that you know the beautiful benefits of this sweet treasure, let’s take it up a notch! Add a few key ingredients and you’ve got yourself a delicious and nutritious way to start your day. Begin by poking holes in your sweet potatoes. Place in the microwave for about 6 minutes, or until softened. Cut down the center of each potato (careful! They will be hot.) Allow them to cool if need be. Carve out the middles into a medium-sized mixing bowl. Using a fork, mash the potatoes until most of the lumps have disappeared. Add in the egg, vanilla, honey, cinnamon, salt, baking powder and almond milk. Whisk together. Turn your stove to Med/High heat. Liberally grease your skillet with Earth Balance butter or coconut oil. When the butter/oil begins to bubble, pour your batter into the skillet. Leave it until you see the edges begin to cook. Using a spatula, “scramble” the batter like you’re making eggs. It will take several minutes before it is ready to eat. Heat another skillet on Med/High heat. Add 2 Tbsp. of Earth Balance butter (or coconut oil) and let it begin to bubble. Add in your cut apples, honey, vanilla and cinnamon. A glaze will begin to form in the pan, so be sure to coat your apples in it! This will only take a few minutes. Plate your Sweet Potato Scramble, topping it with the cinnamon apples. For a special touch, drizzle with honey and sprinkle with coconut flakes. And Voila! You have successfully made a delicious and satisfying breakfast (that feels more like a dessert!) I hope you enjoy this one as much as we did. My husband and brother-in-law certainly didn’t mind being guinea pigs this morning! Perhaps you have a guinea pig or two of your own who’d like to try?